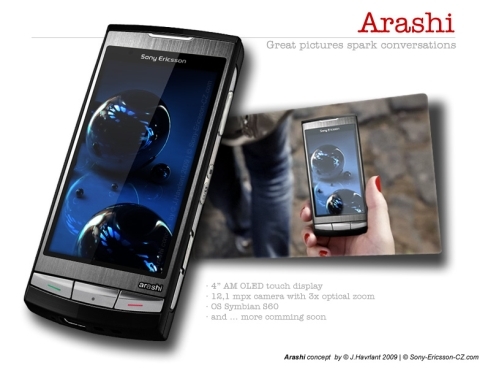 Esato board member and great designer J. Havrlant has finished the Sony Ericsson Arashi concept phone, after showing us a teaser, a couple of days ago. We learn that the handset packs a 4 inch AMOLED touch display and a 12.1 megapixel camera with 3x optical zoom. The designer claims that more details (and probably images) are coming soon and in case you’re wondering, this is a Symbian S60 device. Is this a cameraphone or simply a smartphone with a very, very good camera sensor?